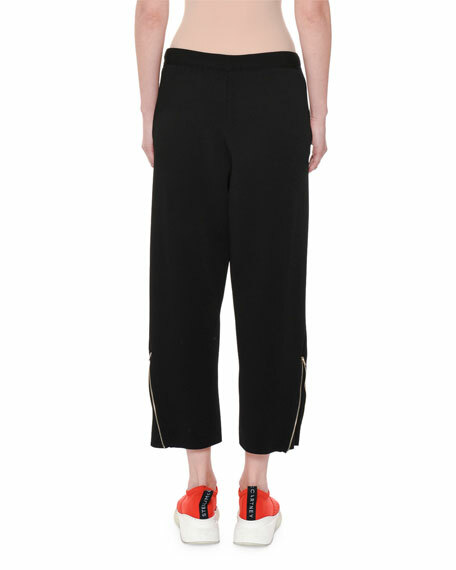 Stella McCartney heavy viscose pants. Diane von Furstenberg pants in lightweight jersey. Mid-rise; hook/zip fly. Side pockets; back welt pockets. Slim fit through boot-cut legs. Diane von Furstenberg pants in lightweight jersey. Mid-rise; hook/zip fly. Side pockets; back welt pockets. Slim fit through boot-cut legs. Cropped hem. Viscose/nylon/spandex. Imported. Model's measurements: Height 5'10"/177cm, bust 32"/81cm, waist 24.5"/62cm, hips 36"/91cm, dress size US 2/4. Kobi Halperin "Peyton" crepe pants with velvet side stripe. Mid-rise; flat hook/zip fly. Side slip pockets. Fitted through knee; flared legs. Cropped at ankles. Viscose/spandex. Dry clean. Imported. Model's measurements: Height 5'11"/180cm, bust 31"/79cm, waist 23"/58cm, hips 34.5"/87cm, dress size US 0/2. 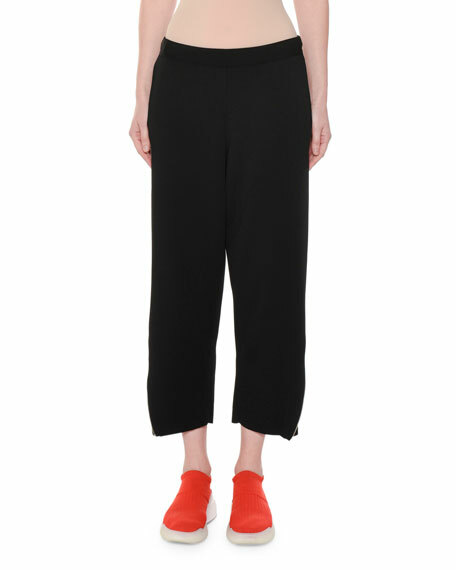 Kobi Halperin "Vana" flared-leg pants. High rise; flat-front; elasticized band at back. Fitted through thighs. Wide leg; flared from knee. Kobi Halperin "Vana" flared-leg pants. High rise; flat-front; elasticized band at back. Fitted through thighs. Wide leg; flared from knee. Full-length hem. Pull-on style. Viscose/spandex. Polyester lining. Dry clean. Imported. Model's measurements: Height 5'10"/177cm, bust 33"/84cm, waist 25.6"/65.2cm, hips 35.8"/91cm, dress size US 2-4/FR 34-36. Misook classic knit pants are comfortable and wrinkle resistant. Approx. measurements: 31" inseam; 42" outseam. No-roll waistband; high rise. Pull-on style. Unlined. Acrylic/polyester. Machine wash. Imported. Model's measurements: Height 5'10"/177cm, bust 33"/84cm, waist 25.6"/65.2cm, hips 35.8"/91cm, dress size US 2-4/FR 34-36.